Almost everyone has at least heard of the Boy Scouts of America (BSA), and many CCSD59 families either participate in BSA activities themselves, or know someone who does. 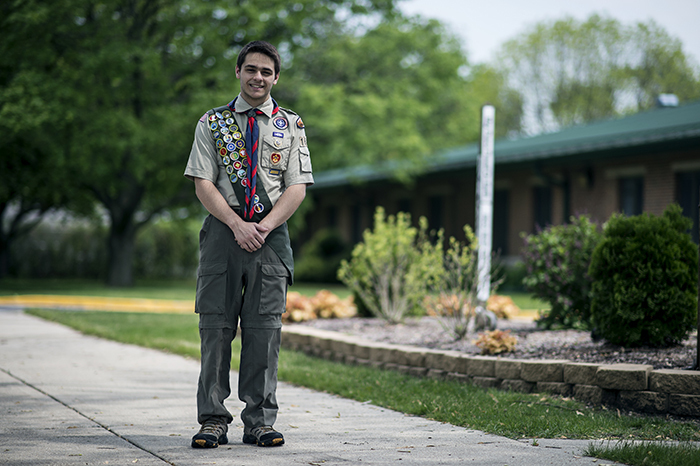 CCSD59 would like to congratulate Nicholas S. Rosenorn, who not only is a CCSD59 alum of both Brentwood Elementary and Friendship Junior High schools, but earned his Eagle Scout status by helping renovate the exterior of Rupley Elementary School. Since Eagle projects need to benefit a non-scout, not-for-profit organization, CCSD59 and Rupley Elementary were a great fit for Rosenorn. He chose as his project to renovate a garden area in front of Rupley Elementary by providing a landscape of plants, trees, and shrubs. He also altered the existing design by leveling the ground with dirt and mulch and adding a new perimeter of garden bricks. Rosenorn’s project coordinated the efforts of over a dozen volunteers which spanned over a couple of weekends. In honor of his achievement, BSA Troop 160 will have an Eagle Scout Court of Honor (ECOH) on June 10, 2017 at St. Zachary Church in Des Plaines. This event provides the opportunity for the troop, family, other Eagle Scouts, friends, and others to formally recognize and honor the achievement. Rosenorn will receive an Eagle binder that commemorates the special occasion with letters of thanks and recognition of his achievements.